As we close in on year-end I hope everyone has achieved what they set out to do this year. One of our Chamber objectives was to ensure we are listening to the concerns of local business. Our business forums in the spring were very successful, allowing us a chance to hear from members and non-members. Input from those forums has already influenced our advocacy and will continue to do so in 2017. In particular, look for more to come on signs. We’d like to do similar forums every other year. I want to congratulate all our winners of the 2016 business awards. 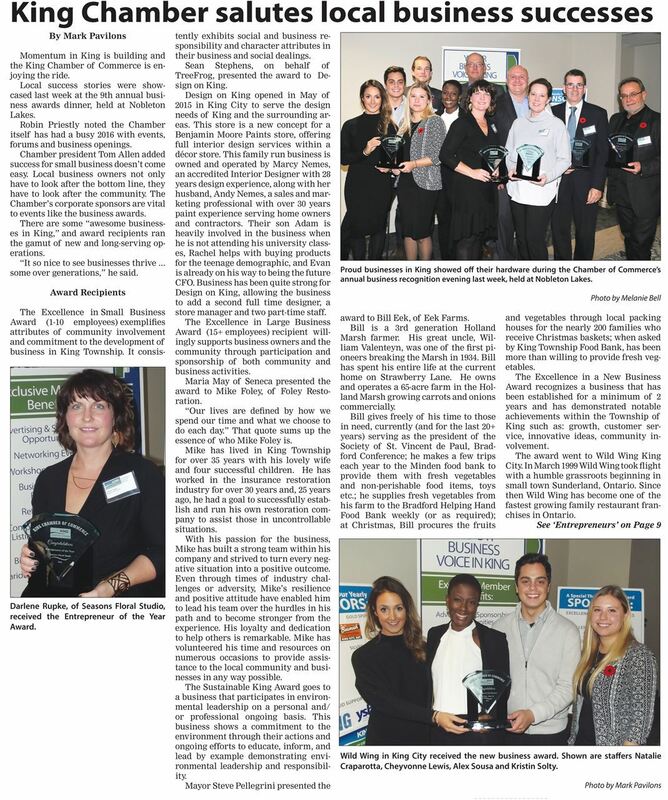 It is great to see some new businesses be recognized for their successful starts. Further, it is wonderful to see the sustainability of many of those winners who have been in business for generations. Again this year our Christmas and year-end lunch was very well attended. I appreciate the generosity shown by all with many, many toys under the tree for local families in need – not just at Christmas, but throughout the year. To our new 2016 members, I hope you have found our networking opportunities and support helpful. To our ongoing members, we appreciate your loyalty to the Chamber as we seek to make King a great place in which to do business. Wayne Emmerson, Regional chairman and CEO of the Region of York, addressed the members of the business community at fi rst annual Regional Chair’s Luncheon May 30 at the Manor in King City. 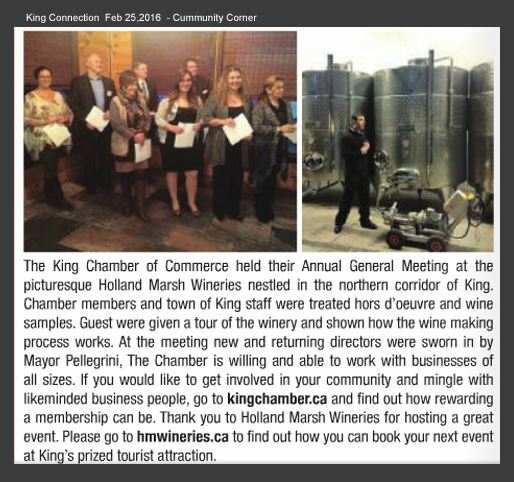 The networking luncheon was hosted by the King, Aurora and Newmarket Chambers of Commerce. Those in attendance heard from the chairman and senior staff about the services provided by the Region, the 2016 budget, economic development initiatives and council’s priorities going forward. “It is truly a pleasure to be here with our local business leaders,” Emmerson began. “It’s people like you, our entrepreneurs and job creators, who largely drive the economy in York Region ... As a regional government, we support you in your effort. Economic vitality is a strategic priority of regional council. Business growth and job creation are common threads that are weaved through everything we do. ” Regional government supports business in four ways – by fostering an environment that attracts, grows and maintains business; supporting the development and retention of a region-wide workforce; focusing on networks and systems that connect people, goods and services and ensuring optimal locations for business and employment growth are available. York Region is one of Canada’s fastest-growing large urban municipalities with nearly 1.2 million people, he noted. “York Region has become a destination of choice with an increasing number of people deciding to live, work and invest in our communities,” Emmerson said. 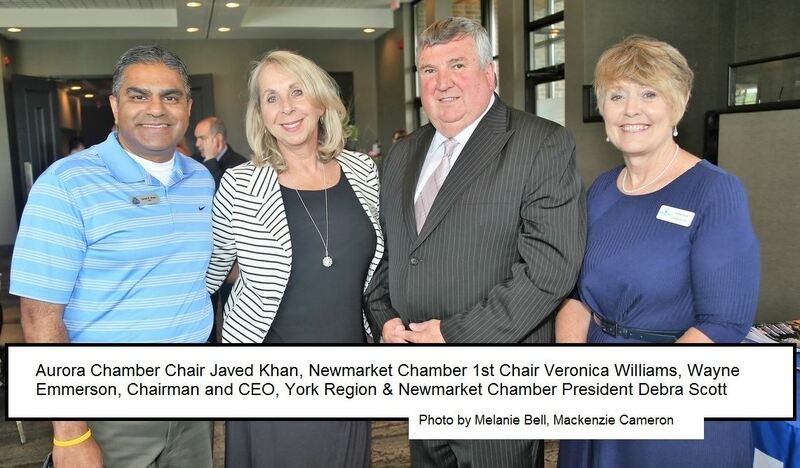 “York Region is also the second largest business center in Ontario with nearly 50,000 businesses employing more than a half a million people.” The key to growth in York Region is the services that are provided, he added. The Region is responsible for providing police services, paramedic services, public health and social assistance and housing. The Region is also responsible for maintaining regional roads and providing public transit. There are nine areas of shared responsibility with municipal governments including solid waste, water, sewage, planning, economic development, emergency planning, court services, borrowing and tax collection. “I can assure you Regional council and our dedicated staff are always striving to provide value for money in everything we do,” said Emmerson. “Our services are of the highest quality and we provide services that people use each and every day. ” Increasing traffic congestion is a top concern among individuals and businesses in the Region. “In response, we have made significant investments to expand our road capacity and increase and modernize our public transit options,” said Emmerson. “For example, we are rolling out the Viva Bus Rapid Transit system across the Region, expanding York Region Transit and extending the Spadina Subway System into Vaughan. ” Leading up to the 2016 provincial and federal budgets, Regional representatives met personally with Prime Minister Trudeau, key federal and provincial Ministers and our local MPs and MPPs. “To sustain our growing communities we need to further expand, modernize and in many cases, rehabilitate our infrastructure,” said Emmerson. “It’s an extremely expensive proposition, so we look to our senior funding partners in Ottawa and Queen’s Park to step up. I have to tell you, we are being bold in our asks. ” The Region’s top priorities are extending the Yonge subway north between Finch Station in Toronto and the Richmond Hill – Langstaff Urban Growth Centre to help remove many of the approximately 2,500 bus trips serving this route each and every day; advancing all-day, two-way GO rail service serving Markham, Stouffville, Vaughan, King and Aurora/Newmarket; completing the final four Viva rapidway segments and working to increase the Region’s housing options, including the development of new affordable housing in York Region. Other priorities include working to secure infrastructure costs to introduce water reuse in the Lake Simcoe basin and expanding public sector broadband initiatives throughout York Region because there are some rural areas in the Region’s jurisdiction that lack high speed broadband connectivity. “I have an idea what you might be thinking at this point – these are very expensive projects and what sort of tax increases can we expect in the future?” Emmerson asked. “We are pushing the federal and provincial governments to pick up 100 percent of the costs of these projects or as close to 100 percent as possible. So the impact on taxes here in the Region should be negligible. Time will tell if we are successful. ” Last year, council approved a multiyear budget for the period 2015 to 2018. For 2016, the Region was able to maintain the tax increase at 2.85 per cent. Over the next two years the increases are estimated to be 2.69 and 2.35 per cent. “We believe this is responsible,” Emmerson said. “This approach aligns nicely with another strategic priority of ours, to provide fiscally prudent and effi cient public services to the residents of York Region. 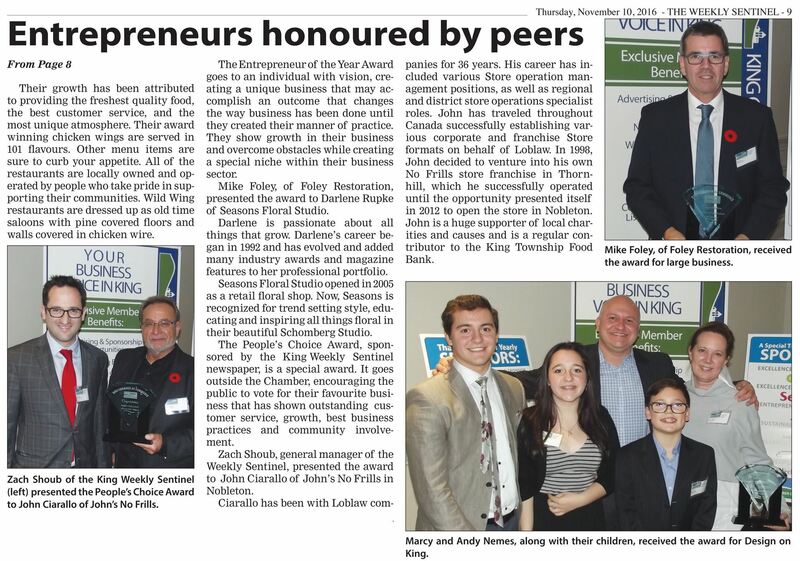 ” Emmerson said he appreciates the business community’s support and contribution to the Region. “You could have chosen to live, work and invest somewhere else, but you didn’t,” said Emmerson. Mayor Steve Pellegrini was in full booster mode as he introduced his latest tool to promote the township: a slick new video. The mayor unveiled the eight-minute clip at his annual Chamber of Commerce lunch last Thursday at Nobleton Lakes Golf Club. More than a hundred guests watched the clip filled with images of King Township businesses, scenery, facts, figures and information. It’s all presented in a professional, smooth style that shows off the best the township has to offer. Pellegrini was effusive in his praise of the video. 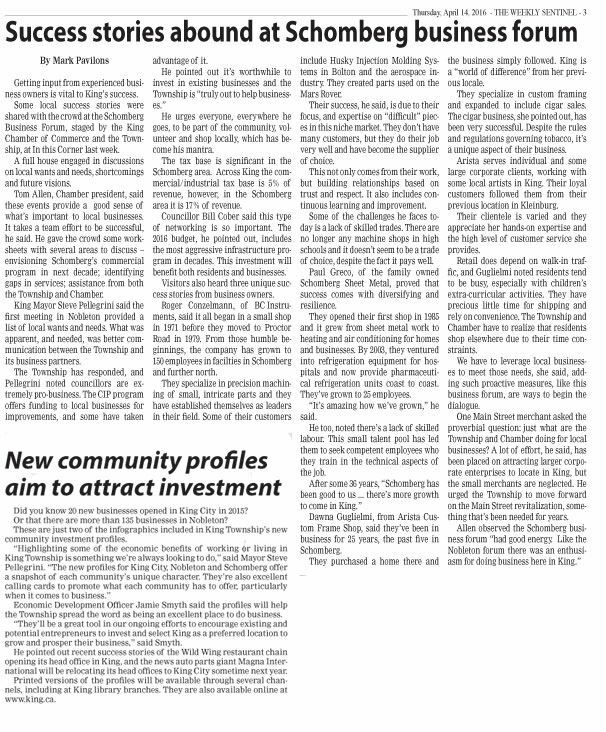 • three new Community Investment Profiles, produced by the township, are full of details about King City, Schomberg and Nobleton, and separately break down by village items like average home price, growth forecasts, median household income, new business starts, locations, etc. He also encouraged business leaders to communicate their needs with the township and to take advantage of any programs offered. To see the new King Township video, go to www.king.ca. It won’t be in time for Family Day or Easter weekend but King Township residents could soon be allowed to shop at businesses here every day of the year. A blanket exemption that businesses be allowed to remain open on statutory holidays has been requested by King Chamber of Commerce to King Township council, which in turn must make the request to York Region council. In a letter to Township council, Tom Allen, president of the King chamber, says retail businesses in King are “subject to a competitive disadvantage in relation to our closest neighbours,” on stat holidays. He cites Vaughan Mills, the Kleinburg core and the towns of Whitchurch-Stouffville and Georgina, all of which have blanket exemptions on statutory holidays under the Retail Business Holidays Act. Allen calls on King and the region to “level the playing field with our neighbouring municipalities by providing a more favourable and competitive business environment,” for small businesses. 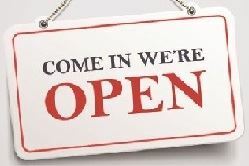 The nine specific holidays when businesses are not allowed to open are: New Year’s Day, Family Day, Good Friday, Easter Sunday, Victoria Day, Canada Day, Labour Day, Thanksgiving Day and Christmas Day. Exempt from the Retail Business Holidays Act are August Civic Holiday and Boxing Day when stores can open. Council is being asked by staff to approve an application to the Region of York for an exemption to the act. The penalty now for non-compliance with the act ranges from $500 to $50,000. York Region is accepting applications for a bylaw exemption until Tuesday, Feb. 16 and will have a hearing date in April. If a bylaw is enacted, it will come into force on the 31st day after it is passed by regional council provided there are no appeals to the Ontario Municipal Board. 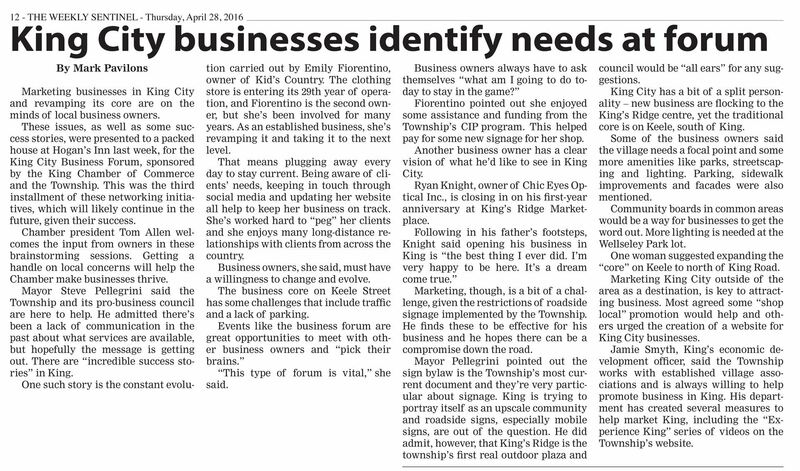 Business leaders in King will gather to discuss business development, in the first forum in Nobleton. 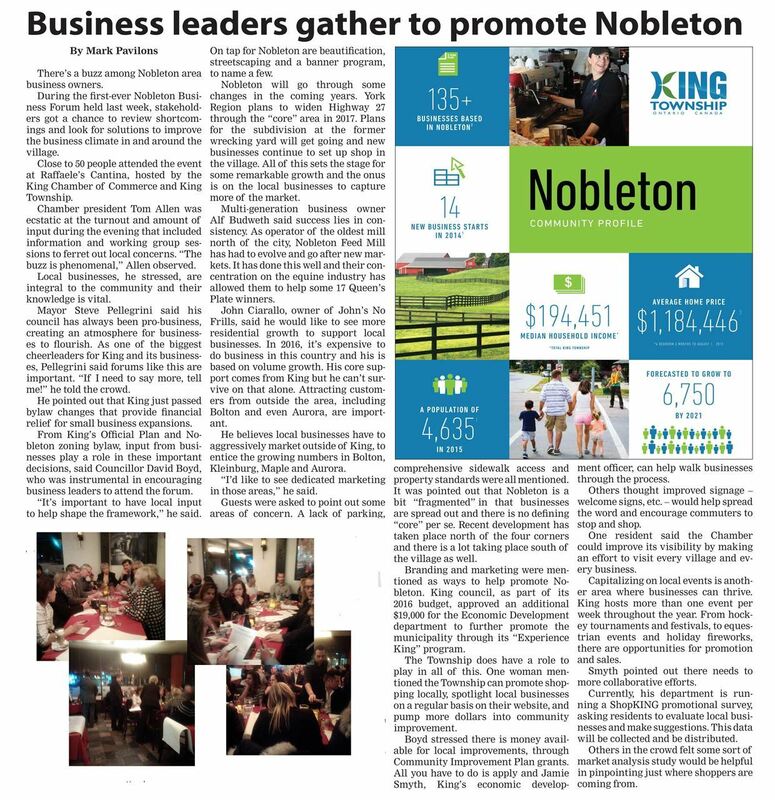 The King Chamber of Commerce and Township have teamed up to present the Nobleton Business Forum Wednesday, Jan. 27. It’s by invitation only and it’s an opportunity for local business owners to share their opinions, ask questions and network, togenerate constructive ideas to boost local busienss vitality. 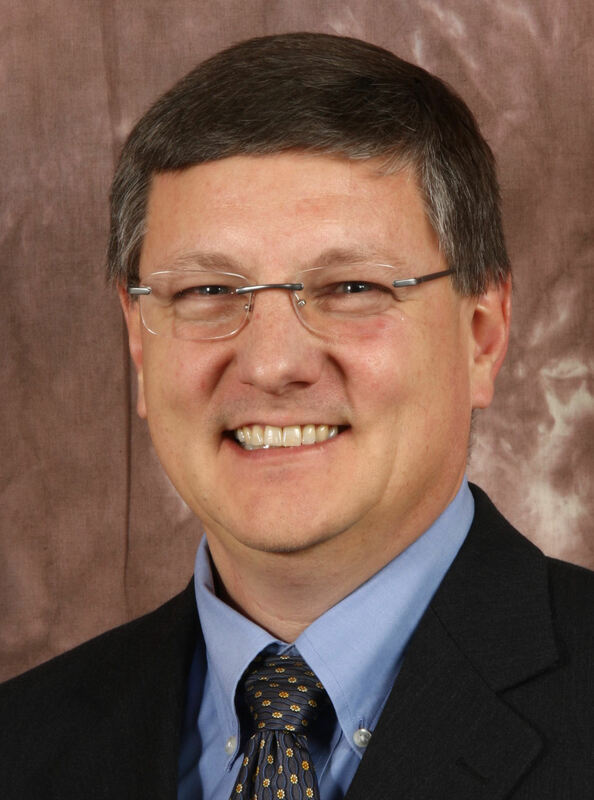 Tom Allen, president of the Chamber of Commerce, said part of their mandate is to ensure local government is well attuned to the needs of our community’s businesses. Boyd added it’s been a pleasure working with Rose Dodaro, the Nobleton representative from the Chamber of Commerce and Jamie Smyth of King’s Economic Development Office to bring this evening together. As a Chamber of Commerce, our focus is to help businesses be sustainable. As we look back to 2015 it is great to see so many entrepreneurs and corporations have the confidence to start a business here in King. Magna announcing it would consolidate some head office functions into King made headlines and many, many other smaller businesses started in King this past year. It is wonderful for residents of King to have local choices. Choice is good for keeping service levels high and costs low as business focus on their best niche. 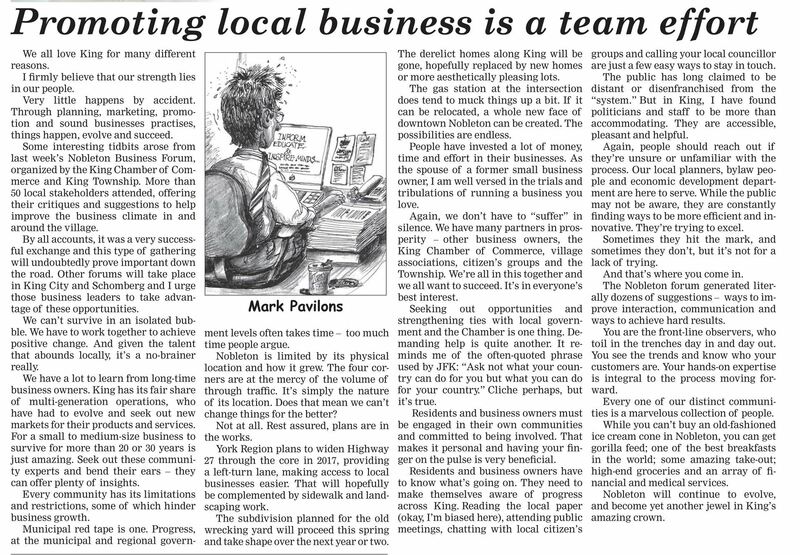 If there is something you need, find the local business that provides that service in the King Business Directory that was distributed to homes in the fall (online version is available at kingchamber.ca). While is it great to see new businesses arrive it is even better to see businesses thrive on an ongoing basis. We had many significant anniversaries in businesses in 2015 from the early like the Bank of Montreal celebrating a one year anniversary, to the career fulfilling 25th anniversary for Foley Restoration, and to the multigenerational Green Tractors, who celebrated 60 years in business. That is sustainability in action. Looking forward to 2016 we will continue to connect people so that our local businesses thrive. Part of this support is connecting business with each other. We will have several networking opportunities this year starting with our Member Appreciation and Annual General Meeting in February and ending with our annual Business Awards Gala at the end of the year. As well, we are looking to continue our work connecting businesses with our local government. Work continues on the Township Official Plan. We have advocated that a complete, functional, sustainable town needs a sustainable business sector to provide local service and especially local jobs. We are working with our local representatives on a series of business forums so the needs of business are well articulated to our local government.